What's the difference between a successful language learner and an unsuccessful language learner? Is it talent with languages? Nope! Last week I wrote that talent isn't necessary to learn a language. So, what then? The three ingredients for successful language learning are time, motivation and an effective method. With these three things, anyone can learn any language successfully. You need to spend time with the language regularly. Even if you only spend 20 minutes a day, practicing a little each and every day is better than spending a lot of time only once a week. You need perseverance! Humans are designed to learn languages. The only way to fail is to give up. If you stick with it, you will learn the language - no doubt about it! I've written previously that language learning is a lot like athletic training. You could say the same two things about exercise and getting in shape: exercising 20 minutes a day is better than working out 4 hours every Saturday and you need to stick with your exercise routine to see results! Because you need to convince yourself to do it regularly and not give up, you need strong motivation! External motivation, like getting a good grade or finding a new job, can get you started - but it probably won't be enough to keep you going. For that reason, it's important to make the task itself enjoyable. You don't need to suffer to make progress! We are naturally motivated to do things we like. As I have written before, I've been learning Polish mostly from reading and listening to books. I love books, even those in my native language! Once I get involved in a story, I am naturally compelled to find out what happens next. I have no problem getting myself to read daily. Other types of deeper motivation can also help: planning a trip to the country where the language is spoken, meeting friends who are native speakers or getting in touch with your roots. Besides just helping you persevere, the latest research on learning shows that being highly engaged and motivated actually improves the natural learning process. Any language learning method will work ... eventually. But some methods are more effective than others. When you use a less effective method, you'll end up spending more time working towards your goals. So, what makes a method more effective? The human brain is designed to learn languages. You activate this brain function by using the language - that is by sending and receiving meaningful messages in that language. 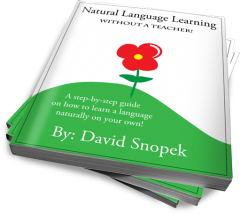 Many language learning methods focus too much on learning about the language (i.e. studying grammar rules), rather than actually using it. Or, they require you to spend time with language that isn't really meaningful. These are common problems with the language programs in many schools. The more time spent actually using the language, the more effective the method is. How your chosen method uses the language isn't really important, as long as you're using the language! You can study by yourself or in a class. Unsurprisingly, so long as your method is reasonably effective, the most important thing is to simply choose a method you enjoy! I am really impressed by the method and ingredients for successful language learning. It is an irrefutable fact that we need time, motivation and an effective method to learn a language. Learning a language requires love, devotion and high level of motivation. To learn any language, if you have got love, dedication and devotion, it won't be difficult master the language. However, motivation and effective methods facilitate the learning process faster and surely. I appreciate your nice work. To those who are looking for good and easy books in english, for practice. I want to reccemend you "coolins classics" collection which is available in Empik stores. There are many of easy and short books in very low price (11~zł). For instance I've just finished "Call of the Wild" of Jack London. Thanks for posting your suggestion! I'm sure someone will find it helpful. :-) Best regards, David. Το λεξικό δεν βρήκε καμία λέξη. Translation: It is all Greek to me. Hehe, that's a good one. :-) I may steal this comment for future use! Successful learning and mastering of a second/foreign language depends on a number of factors. It is a good idea to analyze the factors affecting successful language learning, especially such issues as diligence, dedication, motivation/needs, interest, memory capability, methods and practice activities, content of materials, etc. Learning, practising and mastering a new language is a long process. In addition to formal and self-study classes there should be adequate regular long-term practice in using a second/foreign language (including communication with native speakers) to accelerate success by learners. All language aspects and skills must be learned and practised to eventually master a language: phonetics, grammar, vocabulary, listening comprehension, speaking, reading and writing. No single course can help you master a language thoroughly, for example vocabulary and comprehensive conversational content on a multitude of topics. Only a combination of the above mentioned components can ensure mastery of a language. Thought-through content for practice is crucial to first encompass relevant content for one's needs as there is an enormous amount of diverse content in language resources. If you are a Chinese and want to learn the language of Singapore there are tutorial where you can Learn Mandarin in Singapore and also to know the culture of Singaporean country. This is very important especially if you are working on the said country you must learn everything about their culture. It's so great to see courses like this, I'm thoroughly happy with the product I bought and would definitely recommend this product to a friend...thank you so much!